Having modelled in "00" for many years and dabbled in "N" and "009" I needed to have a change. 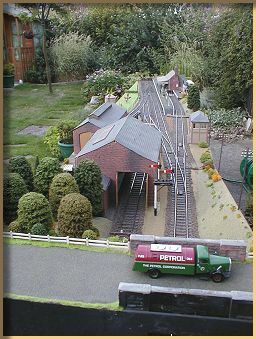 The garden at my present address beckoned to have a garden railway built in it, and the decision to experiment in "0" gauge for the first time was made, as there was plenty of available space. The purchase of a 5-plank open wagon kit and some wheels, and a start down the slippery slope was made. Being rather pleased with the resultant wagon I then took the plunge and bought a kit of a GWR 57xx Pannier Tank – thus sealing my association with the GWR, having previously been a Midland Region overhead electric enthusiast during its early days in the 60s. Some 9 months later the finished engine was tested on the track (laid in the garden during the summer) hauling the solitary wagon. After the next few months of cleaning track and wheels every few minutes, the conclusion was arrived at that the salt air in Felixstowe was not conducive to electric garden railway working. 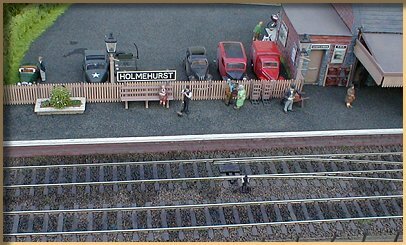 Having spent a large sum of money on the engine, coupled with a long standing desire to build an exhibition standard layout, and you have the beginning of Holmehurst as a layout, way back in December 1989. 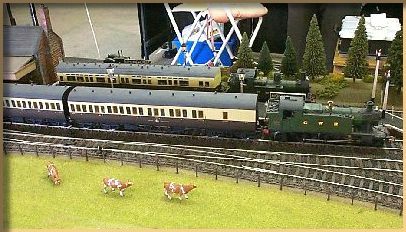 From my previous experiences in railway modelling I knew that planning the layout was extremely important. 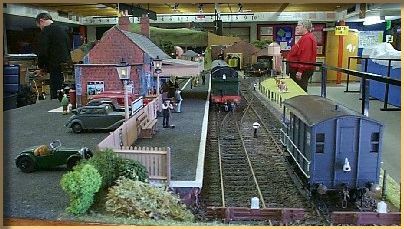 Even more so with a portable one: It had to be as small as possible to appeal to exhibition organisers of smaller events, whilst possessing all the attributes of a station serving a small market town. I wanted a platform to handle a 2-coach train with a passing loop, a bay platform for handling light goods and an Auto-train, a goods shed and yard, and an engine shed. It had to be simple to operate, with very few obstructions on the operating side, giving easy access to all possible areas for uncoupling. All the structures, buildings etc were to be permanently attached to the baseboards whilst at the same time maintaining a minimal distance between paired boards for packing and transporting. The positions of some structures was thus critical in the final interlocking of opposing boards. It had to have a "feel" for the real thing, a slice out of the countryside, no backdrop or relief buildings – the "cut" lines being mere coincidence falling conveniently on open space. It had to be light in construction for portability. 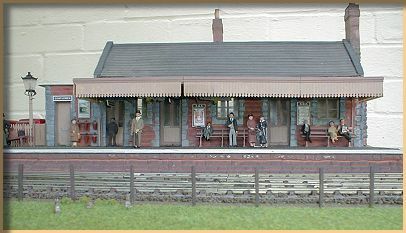 Four main baseboards were chosen for the layout, each measuring 3' x 2', the fiddle yard being a single 4' x 2' board with only a single line. 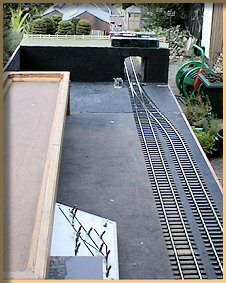 Once a decision on these ground rules was made, I set about wasting many trees with numerous sketches of track diagrams, as well as mock paper layouts of the layout to 1/12th scale to determine that the packed boards would indeed interlock. For those who have never tried this, draw the layout on separate sheets of paper representing each baseboard top surface, then form each sheet into a box to represent the baseboards, in this case each box measured 3" x 2" x 1/4". Stick more paper boxes on to these to represent platforms, buildings, bridges etc as well as roughly shaped pieces of polystyrene to represent any land features. Throw it away and try again until you have the final desired result. It is surprising how even carefully drawn and calculated plans on flat paper can result in the most unlikely problems. With the final effort that satisfied my requirements, construction began. The baseboards were constructed from fibreboard on a 2" x 1" softwood framework for lightness. These would then sit on ready made trestle legs. The trackwork, all Peco Streamline, was laid on the boards loosely pinned down whilst the sleepers and chairs were painted. This stage of the layout almost resulted in it disappearing down the dump: On and off it must have taken 2 years to finish painting them! Things did improve once a start was made on the fourth board and the end was in sight. With the trackwork painting complete the electrics were installed. 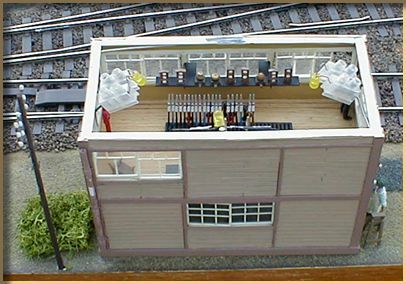 The Gaugemaster controller originally purchased for the doomed garden railway was attached to the fiddle-yard board along with an electronic encasement for the control panel. A temporary wiring loom was formed to test out the principle of the electrics before a more substantial loom was constructed. The ballast was then laid and suitably dirtied in the right places: A motorcycling colleague from work supplied a jar full of something which at some time may have started life as engine oil, and this gave the desired effect. 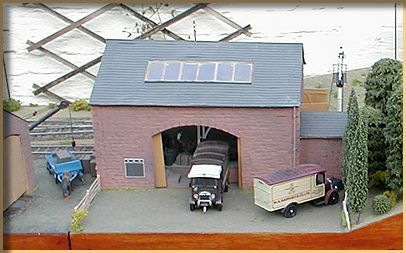 Whilst all this was happening, orders were placed with Derrick Bidwell for initially the station building and signal box, then the road bridge, and finally the platforms, engine shed and goods shed. I make no apologies for not building my own buildings or trees, having tried in the past and failed dismally. The first two orders were dispatched by post, but upon completion of the last order, Derrick rang to ask if he could display them at an exhibition in Birmingham and on his way home he would deliver them personally. Felixstowe is not exactly on the way home from Birmingham to Launceston in Cornwall! With all the main structures now available, the task of fitting the bridge, the platforms and surrounding landscape was undertaken. The landscape was formed from expanded polystyrene blocks, suitably carved and sand-papered. This was my first time using this medium, and the result was quite pleasing – certainly a lot lighter than differing forms of plaster previously used, and certainly a lot easier to get the desired shape. 9mm plywood was fitted to the board edges. The track work, platforms and bridge were then masked off and a liberal coating of Artex applied to the landscaped areas. Meanwhile down at the local DIY store the discovery of some small tins of black and dark brown textured paint was most useful. The black was applied to the road over the bridge, the goods shed road, the station car park and the platform tops, while the brown covered all the remaining areas. Various assorted colours of scatter were used, after painting the whole layout with diluted PVA glue. The plywood edging was given 3 coats of varnish and rubbed down in between each coat. I had decided on the varnished finish to hopefully improve the final presentation. The buildings were attached in their respective positions and the first test run was achieved without any major catastrophes. During the odd spare moment throughout layout construction, various wagons were added to the fleet of one, along with a pair of rather forlorn looking second-hand Leeds LMS coaches repaired and repainted in chocolate and cream, a 14xx and a small Prairie. 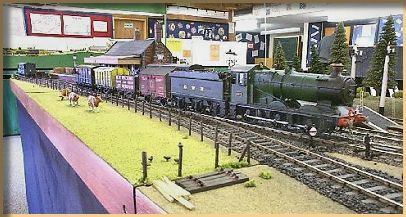 Early in 1995 in response to our club's exhibition manager's second request "Would your layout be ready to exhibit this year? ", I said "Yes". This set me a target date to have something approaching a presentable layout ready for November. Until this point in its life the layout still did not have a name, but what could it be called? This had been a puzzle since the first rough drawing had been thrown in the bin. The answer lay at my doorstep, or more precisely to one side of the front door: The name of my house. 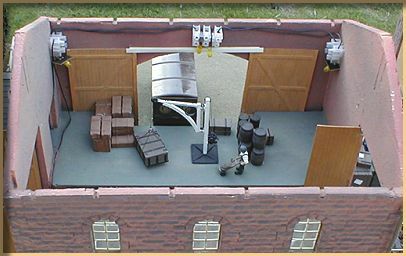 It is at this stage that you realize that major items like locos may cost a small fortune in 0 gauge, but when it comes to all the little bits and pieces to complete a layout – like platform fittings and fixtures, people, water crane, coaling stage, loading gauge, trees, bushes, shrubbery, fences, posters, road vehicles, assorted crates, boxes and the like, telephone poles, signals, pavements etc – then the old bank balance soon runs a bit thin. 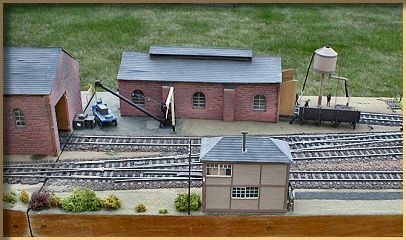 Various kits and ready to use items (bar painting) were purchased, built, painted and securely attached, but what must be my pride and joy to date is the scratch built coaling stage. This is to my own design, following numerous full size drawings of the desired model. Suitably dimensioned balsa wood strips and "matchsticks" were cut, glued, painted and coal smothered, and resulted in the structure now sitting outside the engine shed. The exhibition drew ever nearer and with only two days to go the three signals were finished and fitted. Until the van arrived on the Friday night to collect the layout to take it to the exhibition no-one had seen the layout. A big gamble, would it be liked, or would it be a disappointment? It arrived safely for its first outing and was duly unpacked, assembled, and introduced to fellow club members: The moment of truth. They liked it. 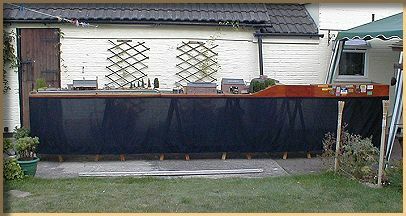 Since then it has appeared at some 30 shows and exhibitions throughout East Anglia and occasionally further afield over 9 years. 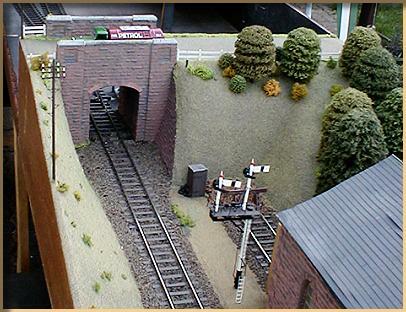 Additions since that first outing include a 16" extension to the fiddle-yard to introduce a second line via a point. 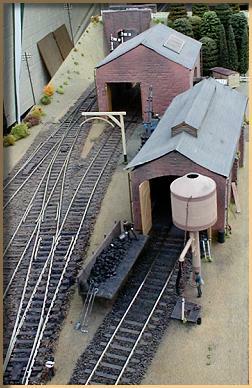 During the initial outings it was found that the single line fiddle-yard was too restrictive in operation at exhibitions. Even the best laid plans are not always right! Some more wagons were added and an Auto-Coach was built, along with two coaches to form the B-set. All three coaches were completed in two months, the two Leeds coaches being gracefully retired after some sterling service as stop-gaps. A second-hand Collett mixed traffic Class 2251 was purchased. I have built another engine, a Manor class (Fringford Manor) and purchased a second-hand Dean Goods and another Pannier. I have also altered the end of the layout, by adding a piece of scrubland, hedge and a row of poplar trees to remove the harshness of the station car park. 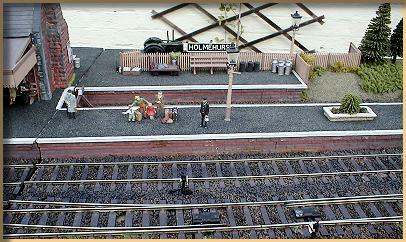 Here are a few further scenes from the station area, as a conclusion to the story of Holmehurst.